View More In Pillows & Stools. Bend and shape the Petite Comfort-U in any number of ways to suit your individual needs. Designed for upper body and hip support, the Petite Comfort-U molds to the contours of your body for that extra comfy feel. The Petite Comfort-U Body Support Pillow can be extremely effective at helping to reduce back pain. It's great for your maternity needs and the entire family, and since it's filled with Foss fill, it's totally hypoallergenic and machine washable. The Petite Comfort-U comes with a white cotton/polyester washable pillowcase. Measures - 44\" Length x 9\" Diameter. Handcrafted in the USA. Shipping weight 8 lbs. Daily fluffing of your Comfort U is recommended. Manufacturer recommends laundering in a front loading, commercial size washer and dryer (as in a Laundromat). The Comfort U is large and needs the space to move around to dry. It is also recommended to add a tennis ball or clean gym shoe to the drying cycle to evenly fluff the pillow. 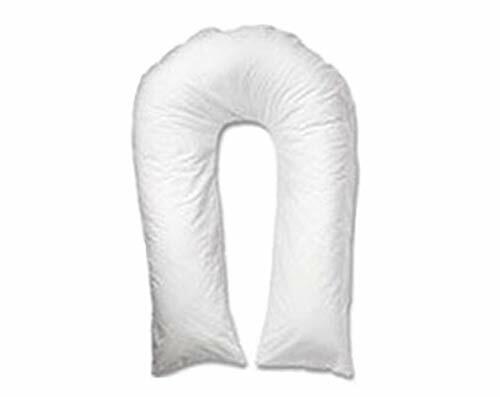 Comfort-U Body Support Pillow offers you all the support you need. Can be extremely effective at helping to reduce back pain. Measures - 44\" Length x 9" Wide. If you have any questions about this product by Moonlight Slumber, contact us by completing and submitting the form below. If you are looking for a specif part number, please include it with your message. Twin Z Pillow + 1 Designer Anchors Cover + FREE Travel Bag!